The configuration of the Baltic Sea coastline predestines maritime transport for both sustaining cross-border scale interactions and connecting more distant areas with each other. The potential of the maritime transport for the territorial integration of the Baltic Sea Region may be further strengthened especially in the areas where distances are too short for using air connections, and bridges or tunnels would be, if feasible, too expensive and not profitable enough. Such an opportunity exists especially for further development of the motorways of the sea. They are an important tool to create viable solutions fostering growth and development and, at the same time, to alleviate the pressure on the land infrastructure. In the territorial context, the motorways of the sea may, on the one hand, facilitate cross-border integration of those areas separated by a narrow strip of water, and on the other — contribute to making the BSR a gateway area for the intercontinental flows. The maritime transport corridors between the northern part of the BSR and the mainland of Europe are important in serving the transport flows between East and West, but may also help mitigate the future congestion in the Baltic Sea lanes. In the context of rapidly increasing seaborne cargo volumes, including the transport of dangerous goods, an introduction of the intelligent sea transport corridors in the BSR would allow for electronic monitoring of specially designated sea traffic lanes in order to prevent ship accidents and take appropriate actions in case of such incidents. A concentration of searoutes can on one hand be observed in the Gulf of Finland, on the other hand in the West towards Great Belt and Little Belt, as well as towards the Kiel Channel, which constitutes for most ships the main gateway to the North Sea and the Atlantic Ocean. 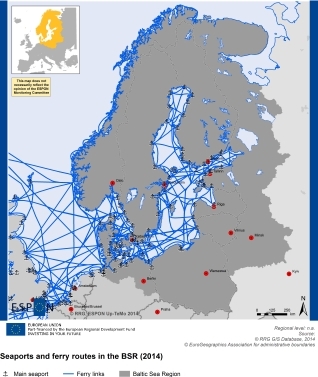 The Baltic Sea already sees a dense network of ports and interlinked ferry connections, both in North-South and Wets-East directions, linking various ports with each other. However, most of these ports are of regional importance only, as they constitute ferry and fishing facilities, but are not considered as hubs in the global maritime networks. Only the large ports of the Baltic Sea are well embedded into such global flows.